This post was originally written in Swedish for the amazing blog Som När Det Begav Sig. You should really go and check it out! Wool really is an amazing material. One of its many properties is its abilities to clean itself in moist weather so that there is no need for constant washing. If you care for your wool garment correctly there is almost no need for washing it in water at all. But if you happen to be sensitive for chemicals it might be a good idea to wash it in the machine before sewing. Washing is best done on the wool cycle, 30 degrees Celsius with mild centrifuge. Warmth + mechanical action makes the wool full itself. 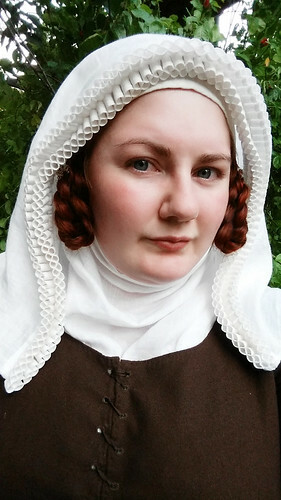 That is something that you can use if you have a loosely woven fabric that you want to make a bit less loose. but if you are satisfied with your fabric I recommend to only go with the wool cycle on the machine. Something that you need to keep in mind is that when washing the surface of the wool might change a bit. 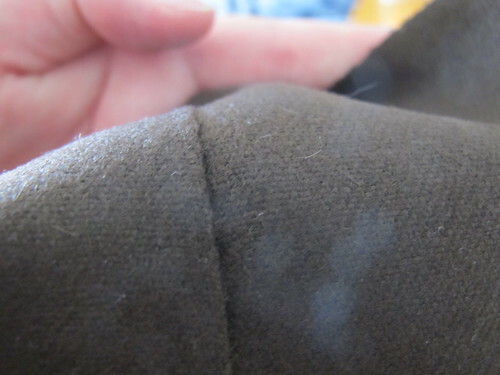 Some fabrics become fluffier by washing so if you want to keep the surface you can steam it in stead. When washing wool (and silk) it is a very important to not use regular detergent as the enzymes are bad for the fibres. Use in stead specialised detergent for wool or silk or even a mild silicone and sls-free (sodium laurel sulfate) hair shampoo. If you know that your fabric will bleed colour when wet or dry, a good way of stopping that is to wash the fabric with vinegar. After washing the fabric with wool detergent once, wash it one time again but this time add 1dl of vinegar in the compartment where you add liquid detergent (if there is on, else just put it in the regular washing powder compartment) and wash it on the wool cycle once more. Using fabric softener on wool is a BIG NO NO! It coats the fibres and stops the small scales on the fibre from doing their work, something that destroys the good properties of the wool. A I have mentioned there is no real need to wash the fabric, but before you start cutting you will have to do something with it. When making fabric, the warp is stretched in the looms, the woven fabric is stretched when coloured and then when it is rolled for the shops is stretched yet another bit. That is why you need to either wash it or apply some moist to make the fabric “relax” again. If you don’t it might shrink later on when it is made into a garment, and we really don’t want that. 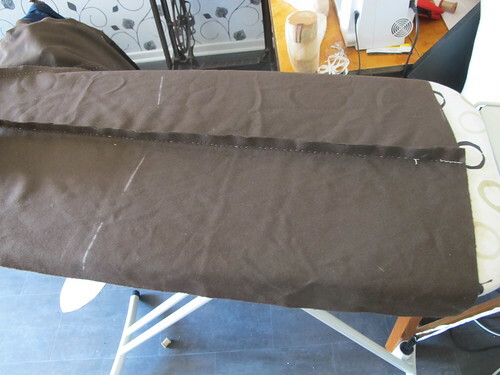 Put one end of the fabric on your ironing board, it should not be folded double. 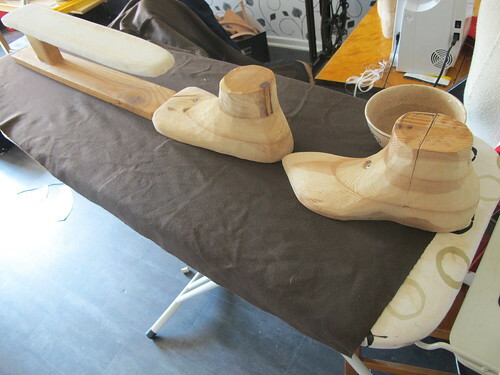 Most of the time your ironing board will be much to small for your fabric so you will have to steam it in sections. If your iron have steam this is so easy. Only hold it just above the fabric, press the steam button and move the iron over the surface of the fabric. When you have done one area, move the fabric and keep steaming all the fabric. 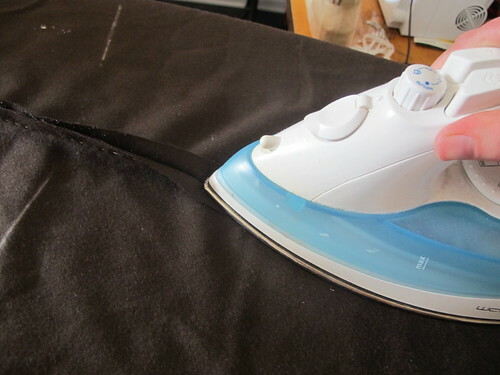 If you do not have a steam iron this can be done in two different ways. If you have a delicate fabric you can put a big piece of washed white cotton fabric over your wool, then spray it with water and iron the fabrics together. Work your way over the width of the fabric this way. 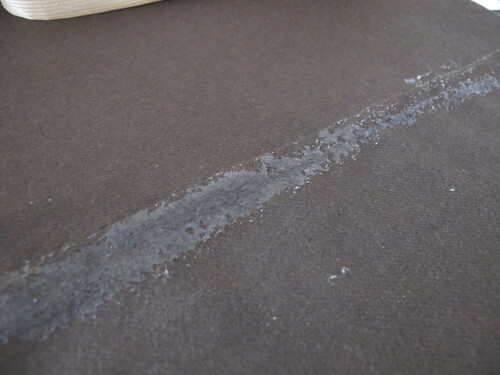 If your fabric is not all that delicate and you are a bit lazy, you can just spray the fabric with water right on the surface and then iron it as usual. Many of you might not have put that much effort into pressing when you have made your garments before. As if it is not enough that you have to sew the seams and then perhaps fell them. That you then should use a lot of time to press the seams might seem like taking it one step to far. But I promise that it is well worth the time. The secret of pressing is “let it cool down”. Note that I say pressing and not ironing. 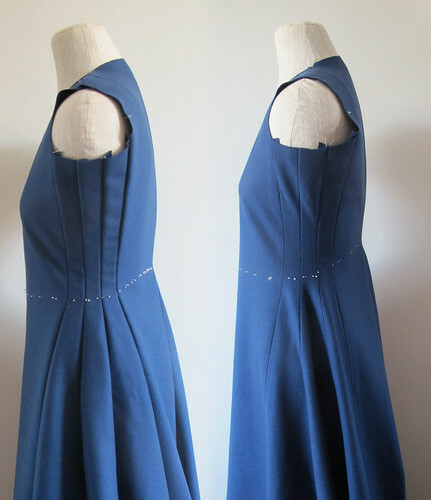 Iron is what you do with a finished garment, but when working on a garment you press it. The difference is that when pressing you add actual weight on the iron, pressing the seams down and letting it take its time. When ironing you only go over the surface lightly. That is also why pressing irons are so much heavier then ordinary irons, depending on what they are for they weigh from 1,5kg up to 5kg. 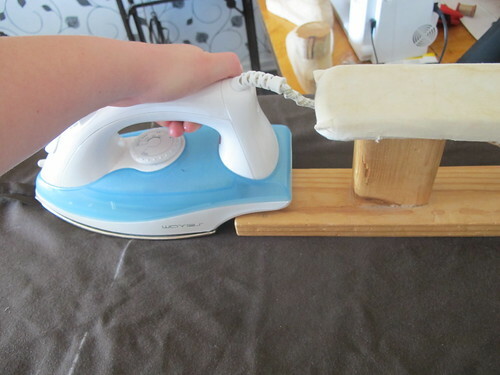 But you can use a regular iron to press the seams as well, you just have to add the weight by pressing it down with your hand. Put your garment on the ironing board. 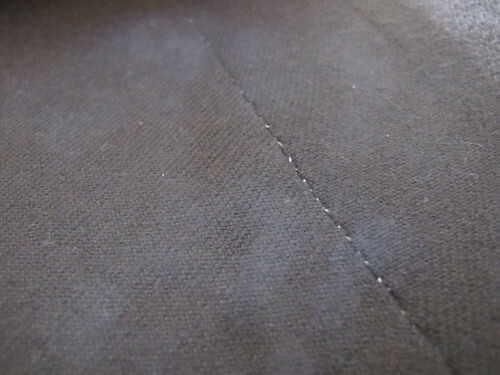 I always press my seams without steam. 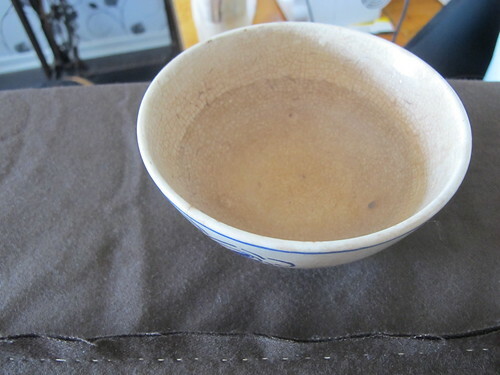 In stead I have a bowl of water on the side. This is because it takes more time for the seam to cool down if you press with a lot of steam. A concentrated string of water will give you the moisture you need but cools down a lot quicker. Also it might depend on your fabric how much water it wants. Some need lot of moisture to become flat while other wants almost nothing at all. 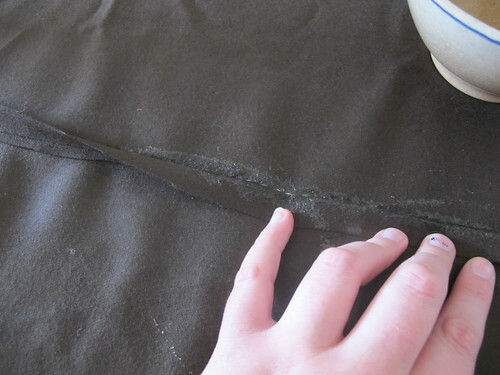 I dip my fingers in the water and only put the water just in the seam, as I said; there is no need to put moisture on all the fabric, that is unnecessary. 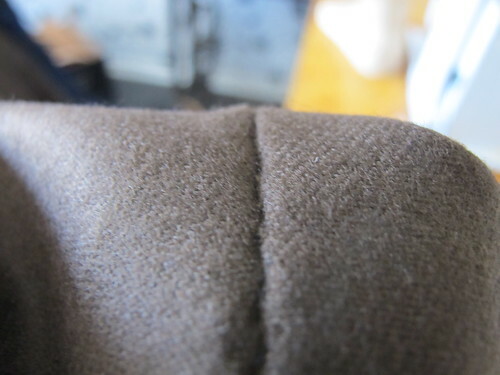 Then I press the seam apart, I press slowly and put weight on the iron. I use a high heat setting (three dots), wool is not harmed by the heat. 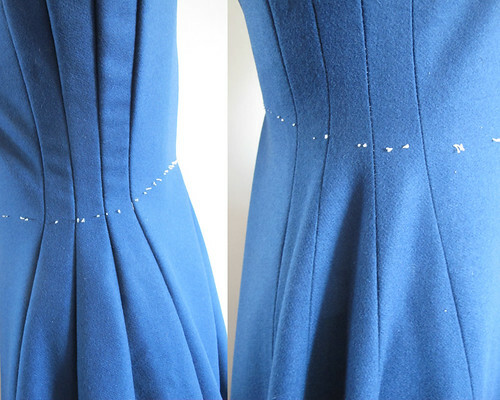 If you think that your fabric is a bit delicate, try the heat setting on a test piece. It it is to warm your fabric might become burnt, it will then be brown and dried out. If you are worried you can lower the heat a bit. 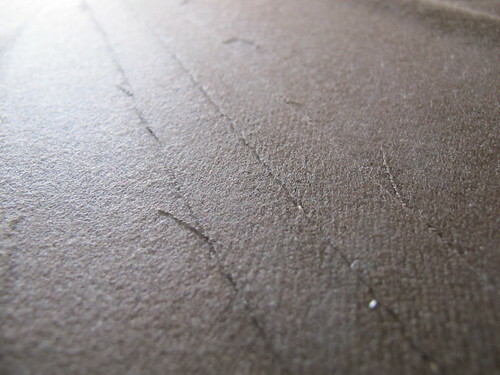 At the same time as I am pressing I put a piece of smooth wood on the seam, I use my sleeve board, but any kind of heavy and solid thing will do. Old books that you are not afraid of ruin for example, or any smooth wood piece. My wooden shoe lasts help me out as well. It is very important that you wait until the fabric is TOTALLY cold until you move the weights, or else the seam allowances might “lift”. If you have done right and pressed well this is how smooth it might become. Really flat, you can almost not see the ditch where the seam is. To show the difference of doing a quick job with the iron and letting it take its time I took these pictures. You can clearly see the difference, not at all flat and with a deep ditch where the seam is. 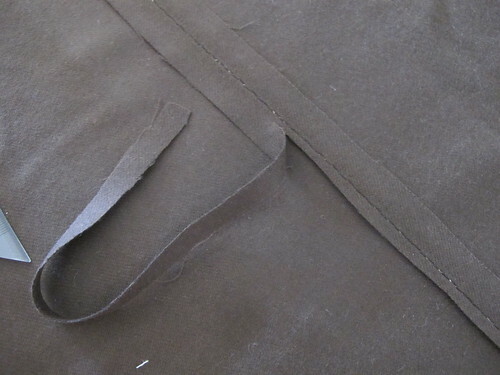 If you wish to fell the seam to one side, first press the seam allowances apart, and then cut down the seam allowance on one side to minimize the bulk. Fold the larger seam allowance over and put water just on the fold and press again (slowly with weigh and then cooling down). See it is so flat! 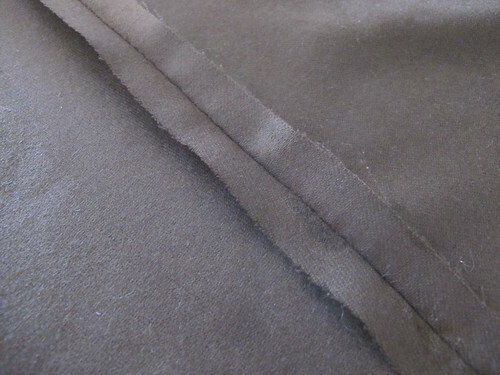 I always sew my garments with 1,5cm seam allowance, but I don’t want so wide seam allowances in the finished garment. 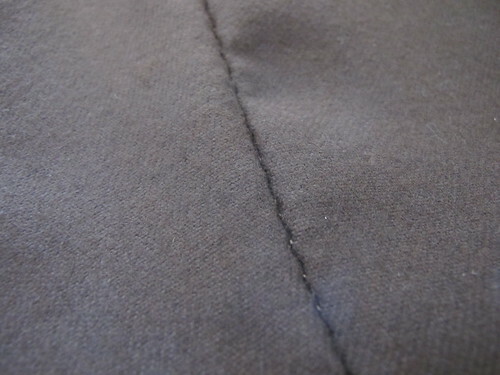 When the seam is pressed I cut it down to 1cm, less bulky and it is more period correct to have small seam allowances. 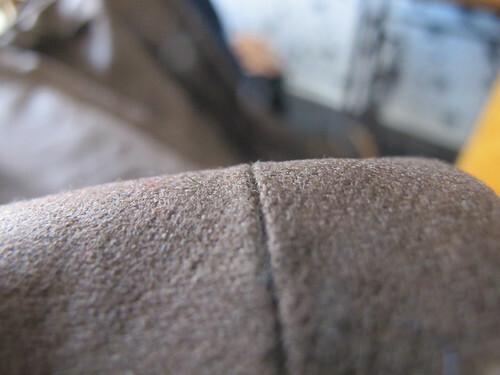 A seam that is felled to one side will of course not be as flat as a seam that have split seam allowances as there is three layers of fabric on one side and one layer on the other. That will make one side lay a bit higher then the other side. Just think of how it would look if I had not pressed the seams first. Then I fell my seams. As can be found in some of the Greenland findings I sometimes put a wool yarn at the edge of the fabric, under the overcast stitches. 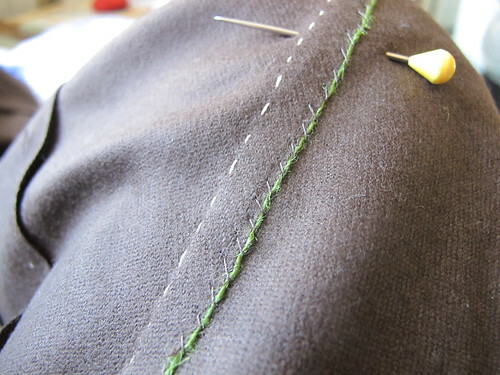 This will help the seam allowance from fraying, and it looks very tidy and neat. If you thought that; now this bloody pressing must be over! I am sorry to disappoint you. When felling the seams it might become a bit bubbly on the right side of the fabric. 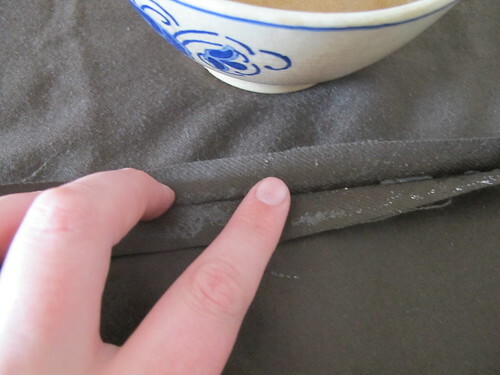 Put water on the seam on the right side of the fabric. 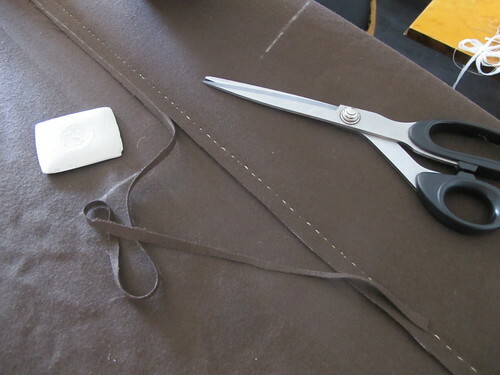 If your fabric is delicate, use a pressing cloth between the iron and the fabric. Press as before with weight on the iron and put the weights on and let it cool down before moving along the seam. And then it is super flat again! Here follows some picture that will clearly show you the difference between a well pressed garment and a garment that is not pressed at all. To the left we see the before press, to the right after press. 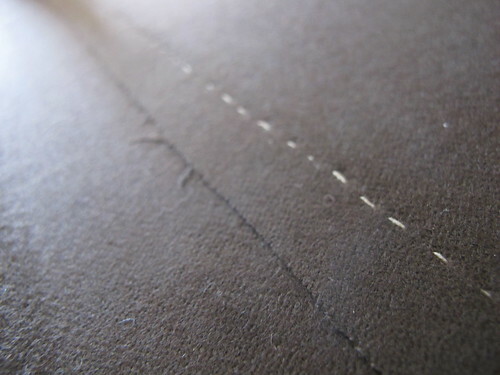 I hope that I have been able to convince someone to at least try to press the seams of their garments. 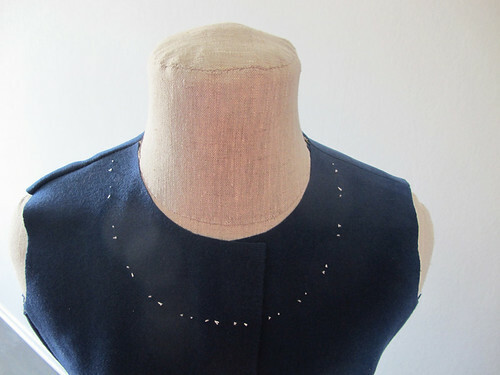 The look of the finished garment will be a lot better and a pressed seam will make the garment look more as if it was one piece. The drape will be better and will of course look more worked. When you have spent so much time pressing you need to be aware that if you throw it in the washing machine a lot of your work will be undone (even on the wool cycle). 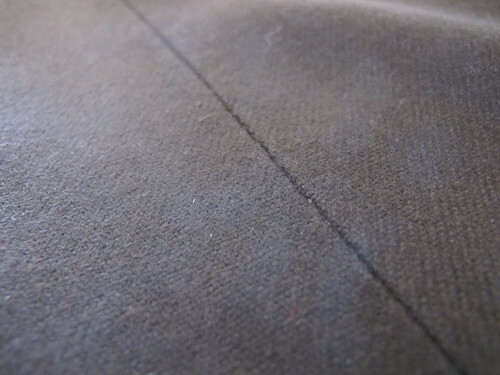 If the seams allowances are cast down to the fabric the seam allowances might not lift, but you will have to press the garment again, at least to some degree. Then it is amazing that the wool fibre is “self cleaning”. Hang the garment to air, preferably when it is moist in the air after rain or at night. If you have no possibilities to air your garments outside, hang it in the bathroom after you had a warm shower and let that steam do the work. You will notice that after a night of airing the garment will be fresh again (smoke might take longer time to get out) and the best thing of all. The press on the seams is still there. 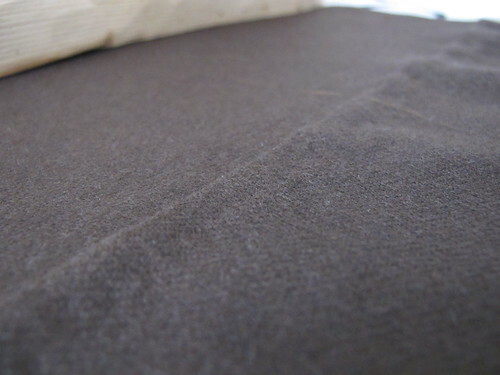 For wool garments it s always better to spot clean and then air it, it prolongs the life of the garment.